We have been working like mad on Caden's room lately, trying to get it done. It's tantalizing to get so close to finishing a project. We are so very close, but there is still a lot to do! One of the things we've been working on is refinishing Caden's door. This house has hollow-core doors in that lovely "cheap veneer" shade of wood. Some of them have been stained an espresso brown, but mostly they are a medium yellow brown and very beat up. It looks kind of like the previous owner might have used a walker or wheelchair and it banged things up, based on the marks on the doors and the walls. Funny story about Caden's door. The night we moved in I was running around the kids' room pulling out a million hooks and nails that I thought they might catch themselves on. I noticed a bottle cap (the kind for a plastic soda bottle) glued to the back of his door. Come to find out, that was our previous homeowner's solution to a door stop. She had a giant victorian-looking hook behind the door (which I also removed...), and a regular door stop would have been too short. Her solution? Glue a soda bottle lid to the back of the door and screw in a soda bottle whenever she needed to have that door open to prevent damaging the door. Necessity is the mother of invention, I guess! We would love to replace the doors with solid wood doors (or even new hollow-core doors), but it's just not in the budget. The doors are not standard sizes and would have to be special-ordered. Plus, then all of the doors would have to be either recycled or thrown out. Seems simpler and more eco-friendly to keep them and refinish them. Some of the doors have holes in them, so staining was not an option. Instead, we patched and painted them, put some new hardware on them, and are enjoying the new, crisp look! First, we took the door off the hinges and laid it on a flat surface. We used a portable work bench and a trash can filled with firewood to prop it up. Next, we sanded the door with 60-grit sandpaper and an orbital sander. Then we took a scraper and some wood filler and filled in the cracks and small holes. Our house's previous owner was a collector, so she had nails and hooks everywhere and in everything, including her doors. After the wood filler was dry, took the door inside and propped it on 2 paint cans to paint it because this is Oregon and it rains a LOT! If we waited for a stretch of a few sunny days in a row we'd be painting in July. Cover the paint cans with a rag to prevent rings in your fresh paint job. Then we used a roller and applied two coats of primer to all sides of the door. Once the primer was dry, we rolled on our paint. Two coats for the grey side, 1 for the white side since our primer was white. After the door was dry, we re-hung it using new hinges and installed the handle, then sat back and enjoyed the newness! It's still a nod to mid-century modern style, since they are flat panel doors, and we went with more modern handles. 1. Take the door off the hinges. Lay it on something raised and flat. 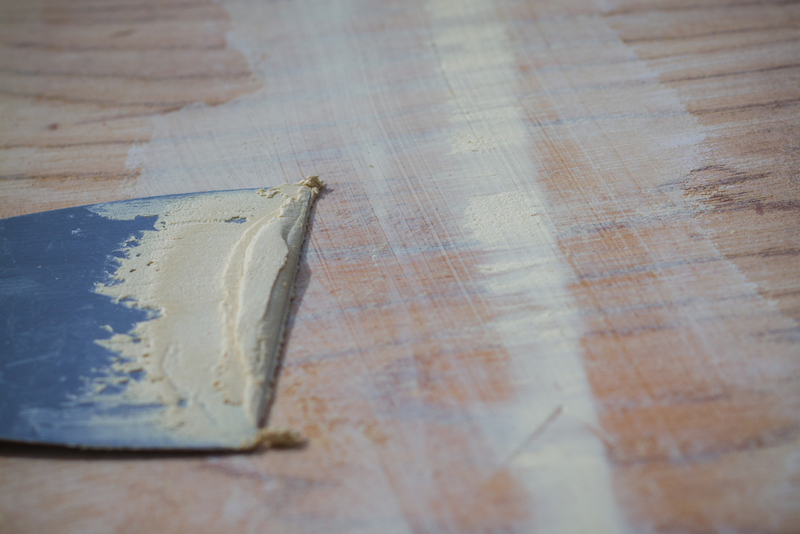 2. sand the door with coarse (60-80 grit) sandpaper and an orbital sander. 3. Patch with wood filler and a scraper. 4. When the filler is completely dry, sand patches and entire door with 120 grit sand paper. 5. Prime (2 coats) with a roller. 6. Paint (1-2 coats) with a roller. 7. Re-install the hinges* and handle and enjoy! * Helpful hint: if you're replacing your hinges, take one of the old ones to your hardware store to match the size.